You can build anything out of Lego. Even huge dioramas based on zombie/apocalypse video games. 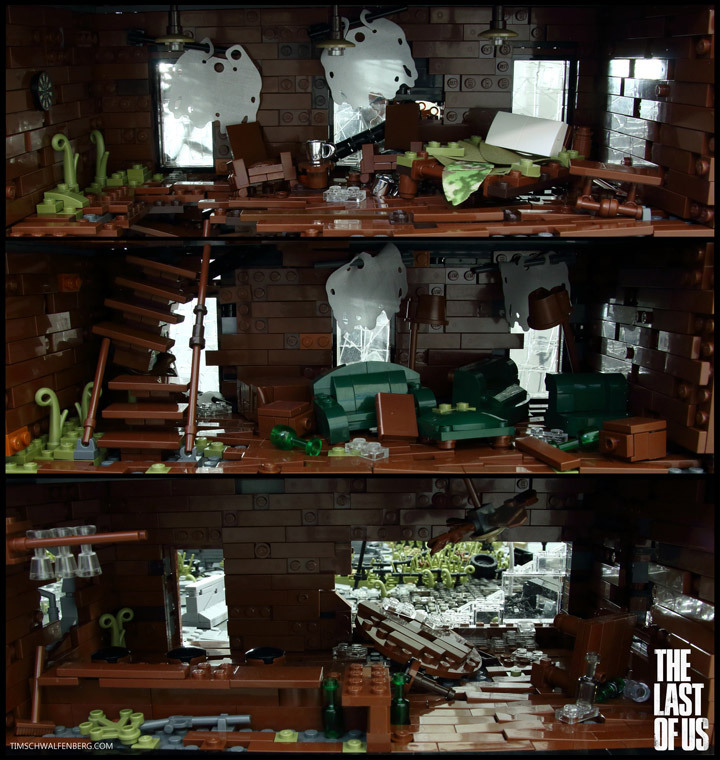 Such as this MOC which is based on the The Last of Us. The game is easily one of the best of the last decade, and a sequel has recently been announced. The ruined buildings have been detailed down to the smallest piece. The whole creation is 3 1/2 feet wide, and 2 feet deep. It uses thousands and thousand of bricks. Interestingly enough, it sounds like one of the buildings here is made up of custom 3D printed bricks. Can you guess which one? The buildings contain some incredible work creating the rundown walls of the buildings. A few of the techniques used can be seen over here. 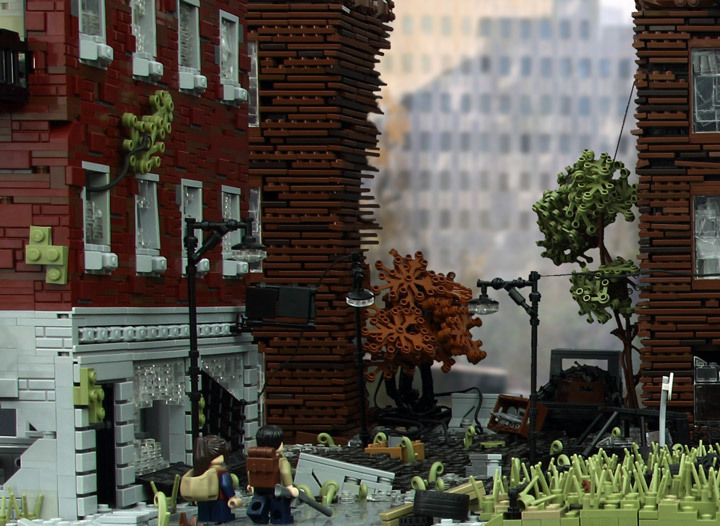 The Lego buildings even have plants and vines growing out of them. The whole overgrown feeling captures the game exactly. You can find some other details too: a ruined bus, a military vehicle, and even Minifigures of Ellie and Joel. An interesting detail are the broken windows. Each building has a different way of creating these. There are stacked 1×2 clear bricks, overlapping multiple small Lego windows, unevenly stacked windows, and a combination of the other three. 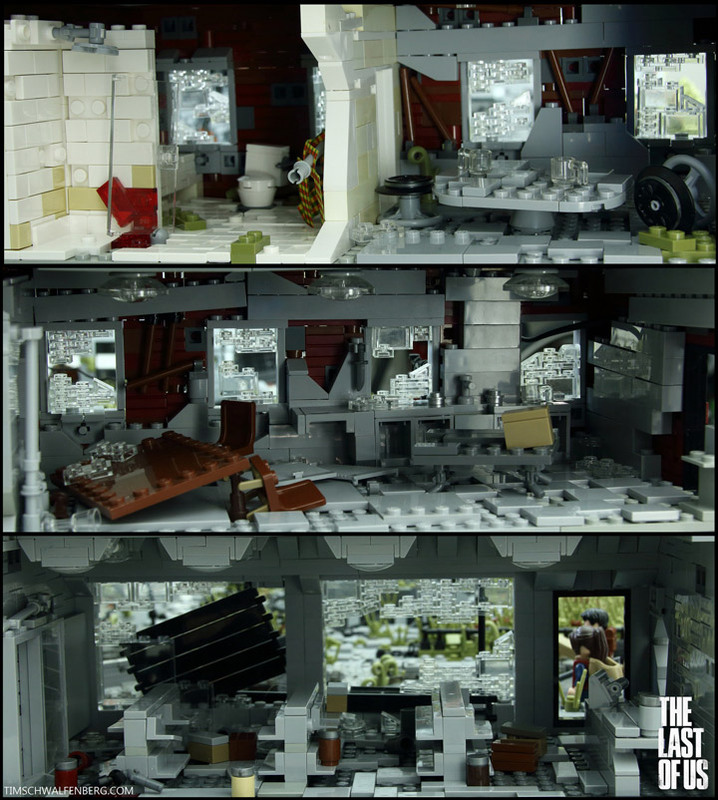 The Last Of Us Lego Interiors. Each building contains fully customized and detailed interiors. Each floor is different which means there are a lot of hidden features in these buildings. A few of the scenes created contain ruined toilets, rundown kitchens, pillaged stores, and broken bars. The only thing missing is a pack of Clickers, crazy Militias, or some Fireflies.